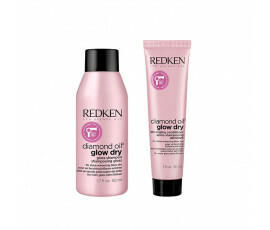 Redken Diamond Oil Glow Dry will make your hair shine like a diamond! This extraordinary line includes a silicon-free oil treatment for all hair types. 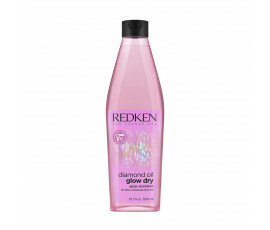 After just one use, your hair will be 30% stronger, 50% brighter with 30% Keratin increase. 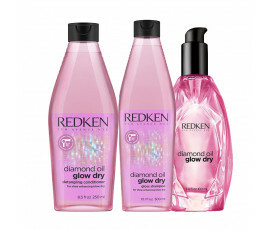 Strength and shine for all hair types. The formula is enriched with Shine Strong Complex, a special blend of oils, such as Camellia Oil, Coriander Oil, Apricot Oil, Olive Oil, Jojoba Oil, Coconut Oil for strengthening your hair leaving it beautiful and Redken Interlock Protein Network, a nourishing mix of Coriander, Camellia and Apricot Oils for stronger and protected hair.